Three painters, two carpenters and two HVAC installers kept things hopping on Cousteau Lane today. The Media Cabinet has been installed in the Master Bedroom. It has raised panel drawers with an applied moulding that will contribute to the overall style of this room. Unfortunately, I didn't move quickly enough with the camera and the drawers were removed and headed to the prep area for sanding and filling. The three doors at top lift up and will conceal the media components operated remotely. The flat panel television is somewhat smaller than the space we have allowed but when the time for replacement comes the option is there for something as large as could be wanted. Six deep drawers are planned for workout clothes and swimwear. The HVAC demotion was begun and completed today. Robert Nickelsen and Alfredo have been up and down the attic stairs more times than I can count. Two of the new units have already been placed in the attic. They will place the third and begin running hundreds of feet of new ductwork. The photos below show some of the equipment that has been removed. 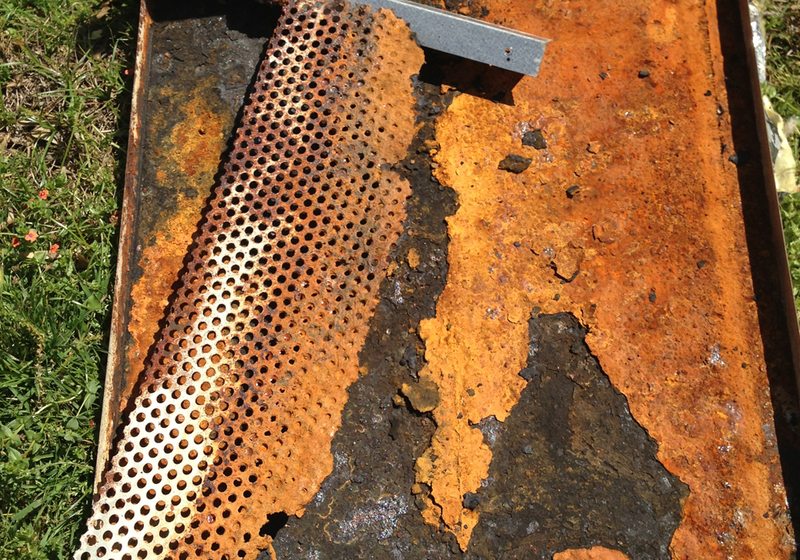 The drain pans have nearly rusted through and the drip plates have disintegrated. in the fourth image you can see a repair that had been done with a bit of strapping and some chewing gum. Okay, no chewing gum, but almost. Click on the image to see all the detail. The Panel Moulding application begun in the Blue Guest Room. You can see the location of the sconces which will flank a Venetian mirror. One of the cool things about this house is the consistent flow of all the public and semi-private spaces yet each guest room has a theme relating to luxury hotels that my Client enjoys. You can see Daniel, Dale Buchanan's apprentice, attaching moulding in the second photo. Omar, Jose and Isaiah (pictured above) continue to work preparing the walls for texture and making every patch disappear. Isaiah has been on caulking and nail filling detail all day. Painting and drywall finishing is a real skill and you can tell a lot about the prep work that is done. These three are among the best and a real pleasure to work with. Of course without a great right hand in the field like Dale Buchanan, things wouldn't run half so smoothly. We have worked together for almost 20 years. He knows a little bit about everything and lot about all types of woodworking. 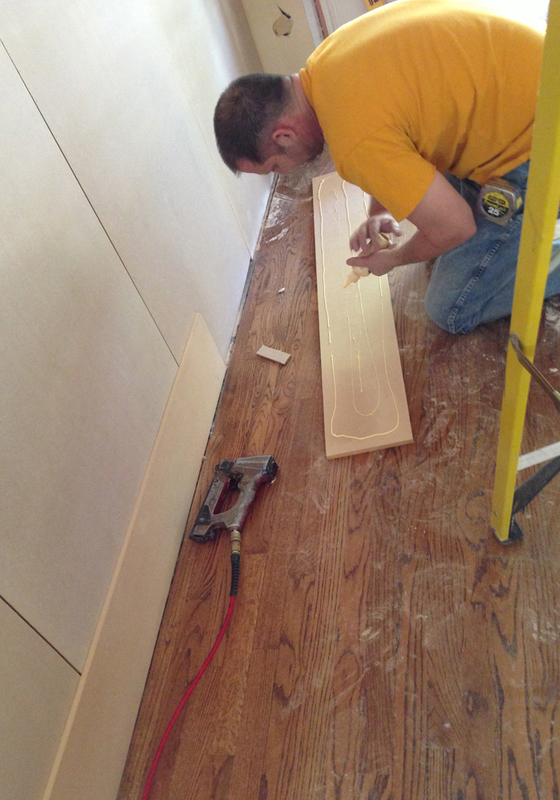 Here he is applying the base rail for the paneled walls in the Entry, which you can see nearly finished below. This will enameled in a deep tone satin enamel "Teal Forest" The material is MDF and Masonite. "Well why don't you use REAL wood?" some ask. MDF and Masonite are both very stable materials. The do not expand and contract like hardwoods. They are also extremely smooth and will give you an almost automotive finish. The last thing you want in a dark paneled wall is much movement allowing joints to open and close exposing unfinished material underneath. You have probably seen this on old wooden raised panel doors. The new header is in and the old furr down in the Master Bedroom is history. The new 92" tall bed will fit nicely now. All the old freon lines are also out of the way. The insulation that was falling down inside the wall has been replaced. The new drywall will be hung and finishing of it begins in the am. Tomorrow morning we are all back at. The Doug Deboe, the painting contractor will arrive with the scaffolding (lots of very high work) as well as the sample of the special finish that will be applied to the Master Bedroom ceiling. The Mike Hamilton, Master Electrician, will arrive to confirm the first part of the work done by his men. He will also confirm what additional items need to be addressed to confirm that the house is safe and the issues we have found are all resolved. Thursday morning, my all time favorite plumber Larry from Overall Plumbing arrives. I have an afternoon appointment with a new client and a meeting in the evening with the Austin chapter of the Domestic Estate Managers Association. It's gonna be another busy, busy day. Tomorrow: custom scarf rack and more.....see you then!